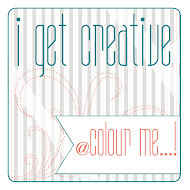 This card is for the latest Create With Connie and Mary sketch challenge. It's pretty simple and I keep looking at it thinking, what else can I add. I'm really a more is more kind of girl. It will be totally suitable for a kid's birthday anyway. I used a couple supplies from the new Occasions Catalog. The printed paper is from a fun new paper stack called Fresh Prints. Sometimes I have a hard time remember the names of the paper packs, but this one will stick with me because of a play on words. Remember the show The Fresh Prince of Bel Air with Will Smith? I heard a silly little joke not too long ago and it went like this....how do you find Will Smith in the snow? Check out the fresh prints....hahahaha! You're welcome. I bet you'll never forget the name of this little paper pack either! Anyway the Fresh Prints paper stack is chock full of bright and bold prints. Super fun! 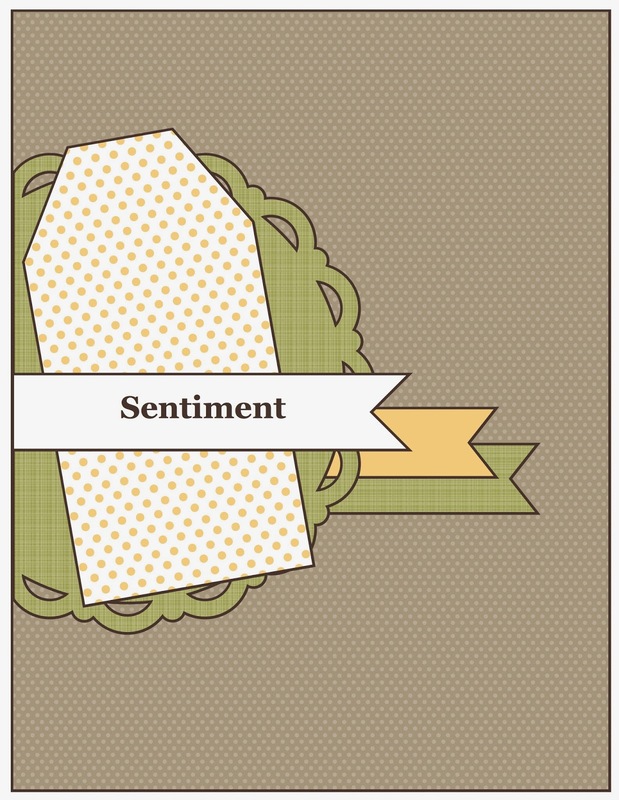 I'm trying out a new way to put my card supply information in my blog. I don't know if I'll keep it....it's just a trial. I love pink, black and white together. It makes such a striking combination, don't you think? I added a little gold in the form of the NEW sequin trim from the spring catalog. Isn't it cool? The sketch is from Freshly Made Sketches. The Ampersand embossing folder is also a new item from the spring book, and also soooo cool! After I embossed it I rubbed it with a little gold metallic encore ink to tie into the gold sequins. The encore pads are being carried over from the holiday catalog to the spring....Oh, happy day! 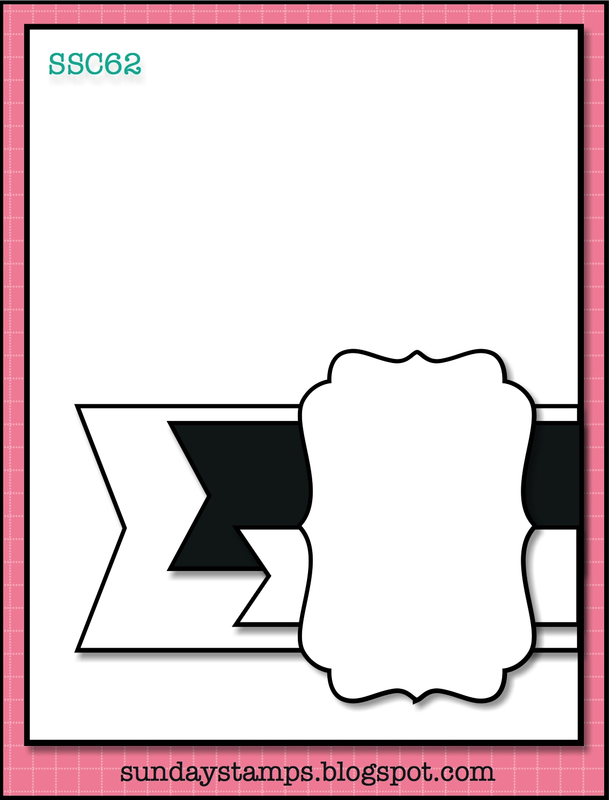 The You/Me stamp is an oldie from a hostess set called Best Yet. The stamp really says "to you from me". I just inked up the "you" and "me" with my black marker and used my stamp-a-ma-jig to place it on the ampersand. You can order most of these supplies HERE. Not only did I have time to stamp today, I also had the inspiration to get something done! After the holidays I crashed for a few days. I spent one whole day doing absolutely nothing but watch one movie after another. It was wonderful! I did some stamping for classes and others before the holidays, but didn't get any of the cards photographed before I gave them away.....hence my absence from blogging. 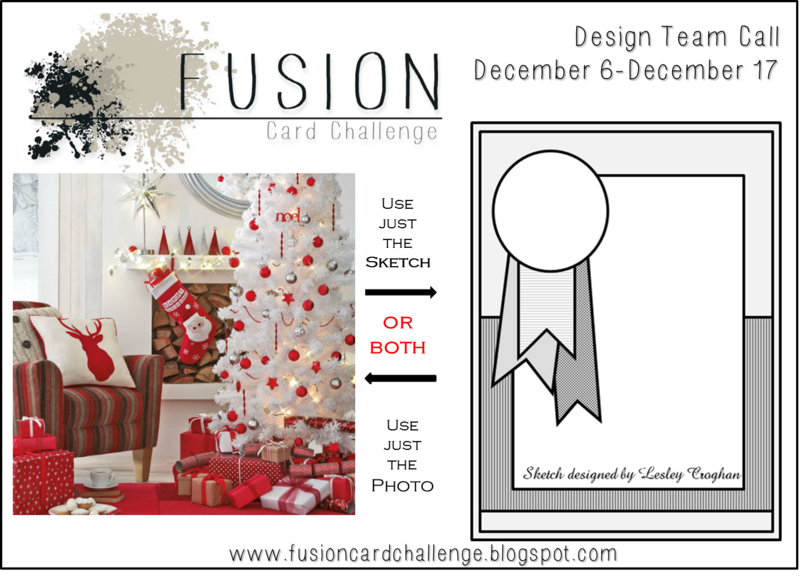 I was browsing around the internet for challenges today and found that Fusion Challenge is still up from a couple of weeks ago. 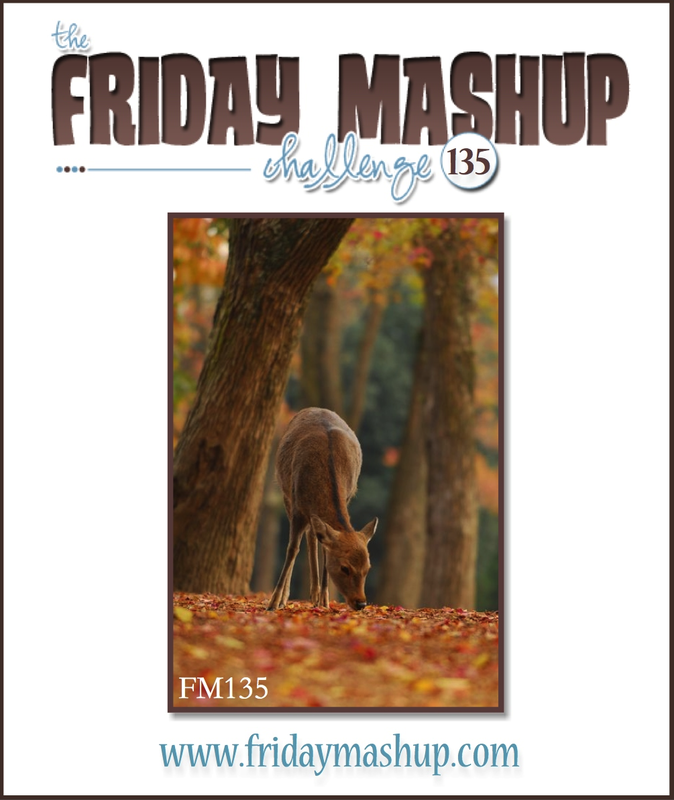 I loved the inspiration photo so much and wanted to do something with the deer stamp. I love this stamp soooo much! I've made many cards with it so far, and my favorite technique is to use heat and stick powder and glitter. I love this image with some sparkle! Since Christmas is over, I wanted to go into a masculine birthday sort of direction. I know that glitter isn't very masculine, but I just can't help myself. It just look so cool! The Natural Chevron ribbon is a new product from the Spring Catalog. It's pretty neat! You can purchase most of these supplies HERE. Here's what some of the other sample look like...what a talented group of ladies! 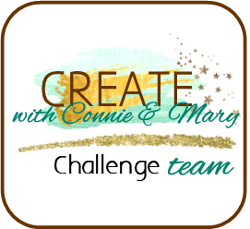 Today's card is for Create With Connie and Mary. The color challenge this week was to use Gold and Night of Navy. I had this gold, sparkly poinsettia laying on my desk waiting to be used, so when the challenge came up, I knew it would be perfect to use. Coming up with a layout proved to be more of a challenge for me. I also had a chance to use up some old, old DSP. It was in a little paper stack that I got 5 or more years ago. I just love the Frosted Finishes embellishments....all you have to do is pop one on your project and it adds sparkle and shine. This card is for Fusion Challenge. It was closed down and because of all the feedback, the administrators decided to open it back up! They are also searching for designers. I was totally enamored with the inspiration picture and sketch this time. I started with the Christmas tree single stamp and a Framelit die cutout I had laying around my scrap pile and built up my card from there. Good Morning stampers! We are inching closer and closer to Christmas....I've been working on cards here and there, but have not had a chance to sit down and participate in many challenges for about a week now. Finally, I found time to make this little gem, which incorporates the sketch from Mojo Monday, Santa from Just Add Ink, and the colors from Color Throwdown. I've never really been interested in any sort of Santa stuff until I saw some projects made with this Santa stamp. He's the first Santa I've owned! I've sure had fun creating with him....most of it has been CAS's. There are a lot of people out there with some great ideas and I'm sure grateful that they share! This post is for a very special person having a very special birthday today....Ms. Anne Marie Hile! I was a fan of AM's for a long time and then got to know her better when I became part of the Dynamic Duos Design Team. We have been facebook friends ever since and I enjoy getting to see glimpses into her daily life, as well as her crafting life through her blog! I know AM has a soft spot for her furry babies and she has quite a few! She even fosters animals until a "fur"ever home can be found for them. So, in tribute to AM for her birthday, I created this fun little card complete with a cantaloupe colored kitty wishing Anne Marie a purrrfect birthday! I used the sketch from Try Stamping on Tuesday. Happiest Birthday Wishes to you Anne Marie! I hope you enjoy your day as you hop around and see all the messages your friends have left for you!!! 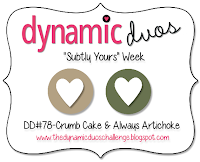 If you have time, hop over to The Dynamic Duos Blog and leave her a little birthday message! Oh, how I LOVE this card!!!! I adore the post card stamp...I think it adds a bit of vintage to any image you pair it with, which I'm a huge fan of. When I first saw this deer image in the holiday catalog, I knew it had to be mine. I love it as a Christmas image! For this card I used colors from The Dynamic Duos and the theme from The Friday Mashup. I started by stamping the Post Card onto Vanilla CS and cutting the image out. I added the evergreen sprigs and pinecones from the retired set Watercolor Winter. I really, really loved this set and wish it hadn't been retired. There are so many cool images in it. Next, I stamped the deer from Remembering Christmas in Versamark ink, sprinkled it with heat and stick powder, heated it with my heat gun and then added the glitter. Finally, I trimmed out the image. I added the "Merry" from Snowflake Soiree and "Christmas" from a Close To My Heart set called Say it in Style. Lastly, I layered a little piece of Early Espresso punched border under the postcard, added some linen thread and a naturals button before putting the whole thing together on an embossed piece of Crumb Cake cardstock and Always Artichoke card base. I spent the day with my sister in law, Jamie, the yesterday and she had on a cute outfit using these colors. Here shirt was red and light gray striped and she paired it with a turquoise tank that peeked out the bottom of the shirt and topped it with a coordinating turquoise scarf. I was so inspired by her outfit that couldn't wait to get home and make a card. 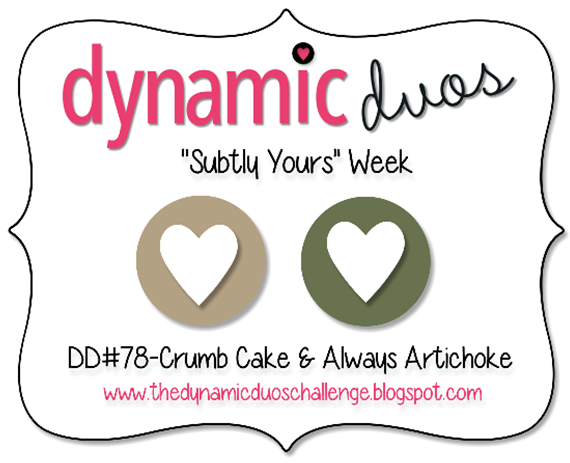 And, I knew these were the same challenge colors over at Create with Connie and Mary this week! LOVE it when that happens! I looked for a sketch to use and settled on Mojo Monday 319. I did tweak the color a little and used Cherry Cobbler instead of Real Red. I'm so pleased with the results! I haven't had a chance to use my Perfect Blend set much and I think it works so well in a Christmas Card. These colors are such fun and worked well with the stamp set. I used the little snowflake from Snow Day stamped onto the Smokey Slate background and also used the saying "warm wishes" from that same set. I used my stamp-a-ma-jig to place the words on the cup. I also paper pieced the Coastal Cabana DSP onto the cup and colored the lid with my Smokey Slate marker. A little Silver Glimmer paper and Frosted Finishes Embellishment add just the right amount of sparkle! Order any of these supplies HERE! The November issue of Paper Crafters Sampler has arrived! 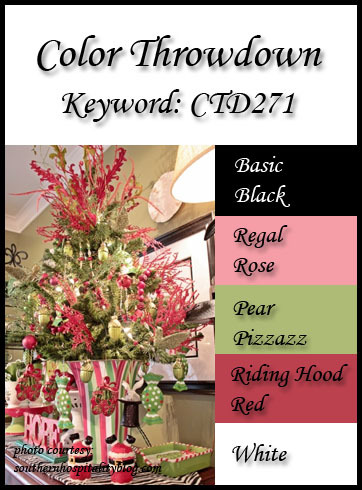 This month we prepare for "A Merry Season" with project ideas for the Christmas Holiday. There are lots of inspiring ideas for you holiday crafting! 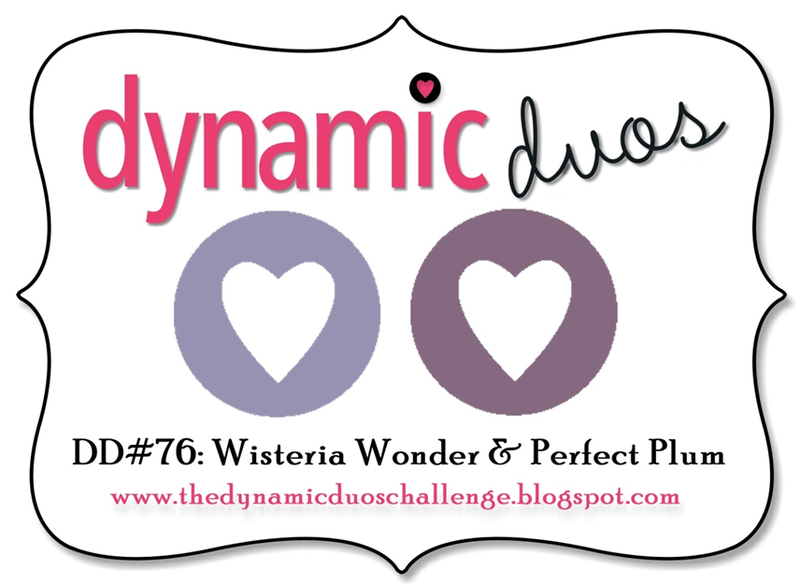 Simply go HERE get a peek at what the other gals have made and to purchase your issue! My younger cousin is getting married on Monday, 11/11/13. What a wonderful anniversary date, don't you think? 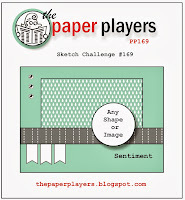 I used the sketch from Sunday Stamps Challenge 62. Her wedding colors are red, black and white, so I obviously incorporated them into the card. I finally got a chance to use the "Love" from the Thinlits Expressions die pack. The "Merry" and "Thankful" have had pretty good workouts, but not love. I had seen a video on YouTube a while back showing that if you put a piece of wax paper between your cardstock and the thinlit die, the paper releases easier from the die. It really does work! Especially with the "Thankful".....it's such a long word. Thank you to whoever was brainy enough to think that up! I'm slowly but surely using up my library clips. I've found a few projects to use them on, but I've found it hard to incorporate them. I think it fits in well with this project. Hello! 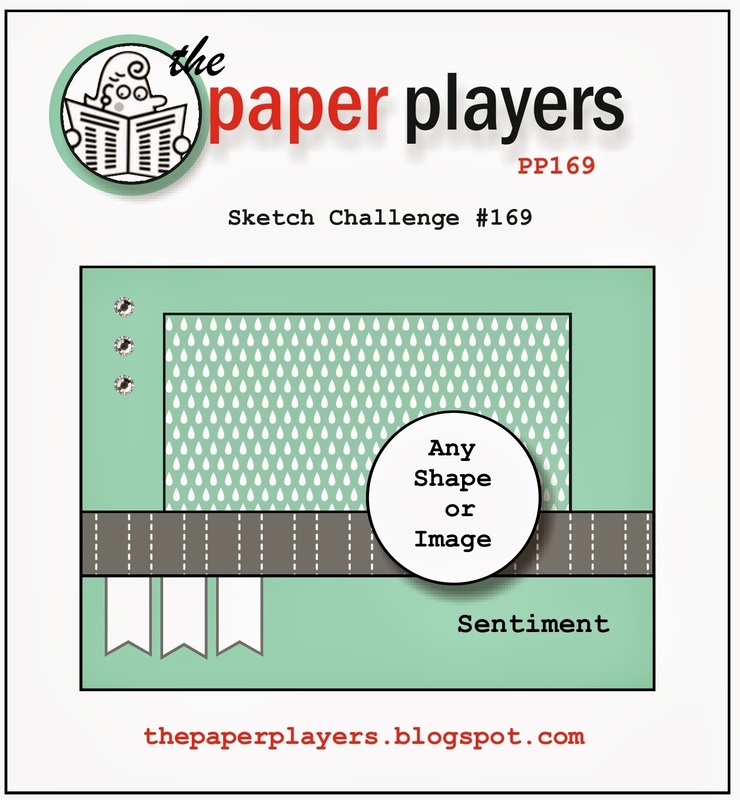 Today's card is for The Paper Players 169 sketch challenge. When I saw the sketch I knew exactly what I wanted to do. I've had this glittery piece of CS with the negative of "Merry" Expressions Thinlits die that I used on another project a little while back. I figured it would be a perfect time to pull it off the shelf and use it! This is also the first chance I've had to play with my Season of Style paper stack too! I love, love, love the kraft polka dot paper. I think it looks great against the pop of Cherry Cobbler. Boy! 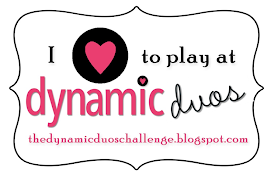 It's been forever and a day since I participated in a challenge with the Dynamic Duos! It feels good to be back! The challenge colors lent themselves to a winter feel, I thought, so that's the direction I went in. I love this new snowman from the holiday catalog. The moment I saw the sketch at Create with Connie and Mary, I knew I HAD to play along. I just loved it! I decided to keep the image fairly matte with just a hint of sparkle and shine in the ribbon and rhinestones. You can purchase any of these items HERE! 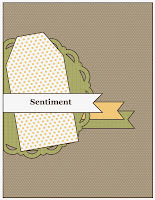 I made this card for Pals Paper Arts 177 sketch challenge. This also works for Just Us Girls photo inspiration challenge 212. For some reason I couldn't get the JUGS challenge photo to appear on my post. You'll have to jump on over to the site to see the photo...it's pretty! The sketch is pretty simple and lends itself to all kinds of ideas. I'm on fall kick, trying to come up with simple cards to do for my card classes. I wanted to try some water coloring with my class, which is so easy and fun to do. I started by cutting the big tag from Chalk Talk die set out of watercolor paper. I stamped the tree in black Stazon ink and then watercolored using my aquapainter. It's so super simple!!! I sponged all the edges with Baked Brown Sugar ink and topped the tag with a looped piece of Burlap Ribbon and a Naturals Button. I layered it on a piece of Tangerine Tango CS after I ran it through the Big Shot with the tree bark EF. I also sponged it with a bit of BBS ink. Lastly, I stamped the BBS card base with the wood look stamp from Truly Grateful and added a little banner made from Sweater Weather DSP. You can purchase any of these supplies HERE!